Susan is a lifelong Alaskan who joined Alaska Public Media as a volunteer in January 2018, and as a full-time employee in September 2018. 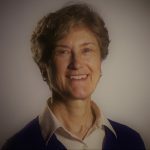 She pursued concurrent degrees in Russian language and environmental biology at University of Alaska, Fairbanks, and University of Colorado, Boulder; and holds a degree in mechanical engineering from Duke University. Trained as journeyman pipefitter, she has worked in engineering and construction for many years throughout Alaska and in Moscow, USSR. Proud parent of two accomplished young women, she is happy in the great outdoors, enjoys theater, music, and loves to dance.